It is your special day and all of the details really do make a difference. One of the most important details for a wedding ceremony is the music. The types of music selection and the instruments used to perform those selections can completely change the tone of the whole ceremony and make it truly memorable. Some common groupings include all strings, all brass, trumpet or flute plus strings, harp, guitar, and even traditional Celtic groups with or without bagpipes. However, most brides and grooms find that hiring musicians and choosing music for the ceremony takes them into uncomfortable and unfamiliar territory. As a professional violinist and music consultant, I would like to offer some basic advice. First of all, be sure to hire professional musicians. People who would not even consider hiring students to prepare their food or take photographs often do not think twice about calling up a high school to find musicians. This is often a big mistake, because even when they have reached a somewhat high level of performance, students lack experience, do not have knowledge of the ceremony, and they have less access to the music needed to perform the ceremony. 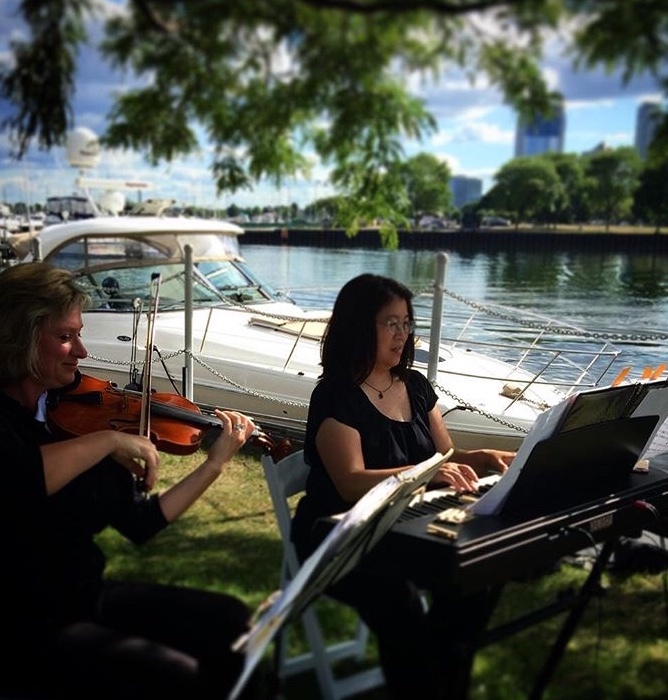 Elegant Music Services, LLC uses only professional musicians, has a large library of music, and offers many different types of groupings for any occasion. If you are getting married in a church setting, be sure to contact the church’s music ministry to find out what possible rules and regulations that there may be about the types of music allowed and whether or not you are allowed to bring in outside musicians. Some churches require you to pay for the music minister whether or not that person performs at the ceremony. Some churches require that all of the musicians be from that church. Other churches do not allow any non-religious or non-classical music during the service. Once you know what you can and cannot do, it is much easier to proceed. After choosing the type of ensemble that will be performing, then you can choose the specific music for each place in the ceremony that you will need music. It is not a good idea to choose music first and then choose musicians to fit the music. You may listen to wedding music recordings to get ideas, but keep in mind that no small ensemble, no matter how good they are, will sound the same as a full symphony orchestra on an edited recording. On the other hand, no recording can give you goose bumps the way that a live organ, trumpet, strings, and timpani combination can. The places where you will need music are as follows: the prelude, the processional, the service music, the recessional and the postlude. Most ceremonies start out with 15-20 minutes of prelude or pre service music. Everything that is performed before the processional falls under this category. It is not necessary to choose specific music for this or to list any selections in the program unless you are having a special selection for the seating of the parents or the lighting of the family candles. After the prelude, comes the processional. You can either choose to have separate music for the attendants and the bride or one song for the entire wedding party. Unless you are in a church setting where they prohibit 2 processionals, either one works well. Brides who have a smaller wedding party or a short aisle are better off with a single processional. Processional music is either slow and lyrical (like Canon in D) or a fanfare (like Trumpet Voluntary). Either type is beautiful and reflects the personal style of the bride. The type and length of the ceremony determine the music during the service. A full Catholic mass can have up to 11 selections. A Catholic plain service and most Protestant services have between 1 and 4 selections. A civil service normally has 1 selection, and a traditional Jewish service has no music during the service. The music ideally serves or enhances the spoken text. It is easier, but not impossible to choose music after the details of the service and where music might be inserted have been determined with the person who will be performing the ceremony. If you are writing your own ceremony, it is important to remember that each music selection performed during the ceremony should be balanced out by spoken text. Too much music can turn your ceremony into a concert and remove the focus away from where it truly belongs. Finally there is the recessional. The rule is, “slow in, fast out,” so this is the ideal place for something really upbeat to put the finishing touch on your celebration. The musicians should continue to play postlude until the guests have milled away from the ceremony area.